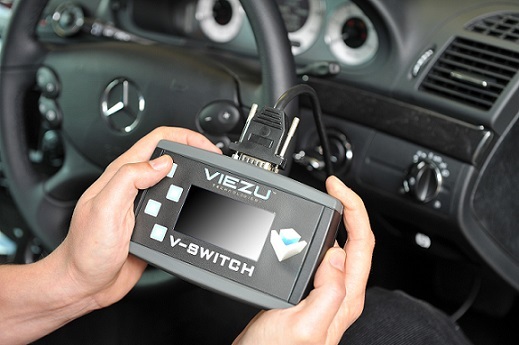 Viezu V-Switch is a individual hand held tuning programmer that is easy to use, designed so you, the customer, can tune your vehicle yourself, giving you the power of flexibility. Extremely easy to use and simple to operate ? no need to be a computer whizz to use this tool, you can now remap your car in the comfort of your own home. The V-Switch tuning system is capable of reading and writing tuning software and settings for hundreds of different vehicles in all shapes and sizes. Uniquely, and very importantly, the V-Switch will also store up several different tuning files all custom made for the same car ? the original factory setting and two modified tuning files of your own specification and requirements. This gives you the ultimate decision to get the best out of your vehicle, from an economy during the week to a power map at weekends, you decide! Tune your car to your heart's content with the Viezu V-Switch, and change the power, performance and setting of your drive in just minutes.